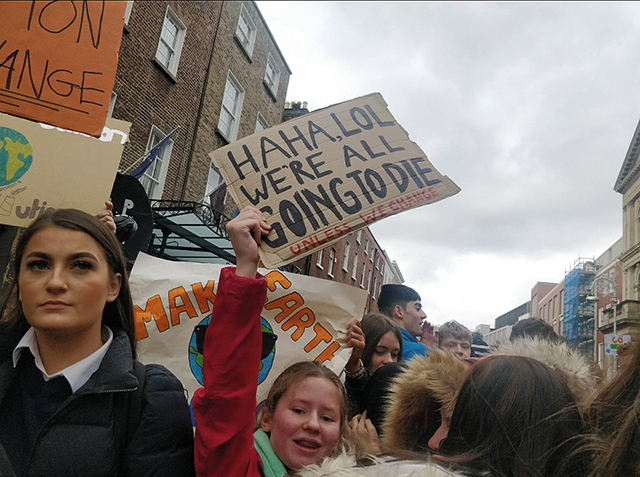 Thousands of children demanded that the Irish Government listen to their concerns on climate change, as they marched through Dublin and gathered outside the Dáil last Friday. “We watched the video of the girl named Greta who inspired us very much,” said 10-year-old Chloe Harrington, on how she and her classmates became interested in this issue. “Pollution and fossil fuels” are what Harrington believes are the biggest threat to the climate. The global movement was the initiative of Swedish 16-year-old environmental activist Greta Thunberg. The strike which happened in Dublin was just one of 37 that happened across Ireland on March 15th. After the thousands marched through the city and braved varying weather conditions throughout the day, they stopped at Molesworth street opposite the Dáil. Here, activists aged 18 and under took to a solar panelled stage to speak about how the Irish government were failing to seriously address the climate crisis. “Today isn’t just an excuse to doss,” said speaker Beth Doherty who delivered a powerful speech to the crowd in Dublin. “I’m not a politician, I’m a 15-year-old terrified by the reality of climate change and terrified by the fact that the people behind us [in government buildings] are doing nothing to stop it,” she continued. One of the major issues discussed was the stalling of legislation which would ban oil exploration off Ireland’s coast. Ireland is one of the worst offenders for not addressing climate change according to findings from the watchdog Climate Change Advisory Council. In an annual report by them last year stated that Ireland is increasing its rate of emissions by two million tonnes a year despite being one of Europe’s worst for emissions prior to this. The Council recommended that a carbon tax be introduced however Minister for Finance and Expenditure did not include one in his budget. “Take it seriously,” said Green Party TD Catherine Martin on what the Government need to start doing to tackle climate change, while she was attending the strike with her children. “Stop these snazzy tweets and snazzy announcements and then do nothing. One thin that’s very simple is to change the 2 to 1 investment of roads over public transport. That needs to be the opposite way,” she told The College View. Government have made some changes such as becoming one of the first countries in the world to divest public money from fossil fuels.